Andiamo Exploration Limited was incorporated in 2008 to undertake exploration for and development of volcanogenic massive sulphide (VMS) and orogenic gold deposits in Eritrea. The company has systematically explored the large Haykota licence which lies along strike from and 50km south of Nevsun’s Bisha Mine. Eritrea lies in the Arabian-Nubian Shield which hosts important Neoproterozoic VMS and early Phanerozoic orogenic gold deposits. VMS deposits include Bisha (Eritrea), Hassai (Sudan), Jabal Sayid (Saudi Arabia) and Hamama (Egypt). Gold deposits include Sukari (Egypt) and Zara (Eritrea). VMS deposits commonly occur as “strings of pearls” along favourable horizons, as in the Flin Flon district of Canada. The series of deposits discovered by Bisha Share Mining Co, which extend to the Asheli deposit 15km from the northern boundary of Andiamo’s Haykota licence, indicate that this is likely to be true in western Eritrea. The Haykota licence, with its southern extension, contains 60k strike length of the favourable horizon. Geophysical, geochemical, geological and remote sensing surveys over the original 750km2 licence area led to the identification of about 40 targets, which were followed up by ground geophysical methods, detailed geological and geochemical surveys and drilling. 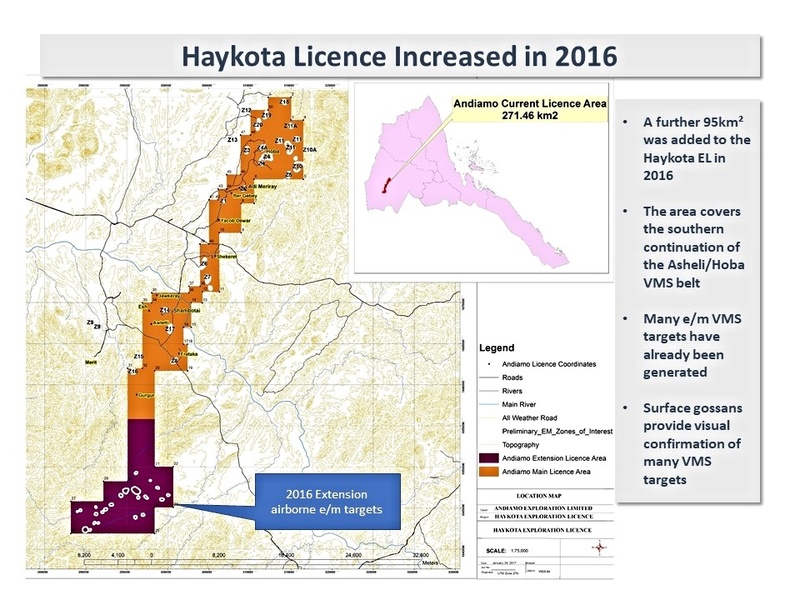 In 2016, the company was granted a southward extension of 90km2 containing a further 30 targets identified by previous licence holders but not followed up. The Yacob Dewar oxide gold deposit holds a JORC Indicated Resource of 80,000 ounces of gold at 2.8g/t. Metallurgical tests have indicated that the gold can be efficiently extracted by cyanide leaching with better than 90% recovery. The deposit lies in the top 40m of a sequence of weathered rocks, within 6km of a sealed trunk road. Andiamo has completed the resource geology and is well advanced with metallurgical and environmental studies. Preliminary financial modelling indicates revenues of $60 to 80 million over 2 to 4 years, with profits of $20 to 40 million. The capital requirements to obtain a mining permit, construct the mine and commence production are estimated to be $5M to $10M. The possibilities of blind, faulted or en echelon extensions of the Yacob Dewar gold mineralisation will be tested by a programme of shallow RAB or air core drilling. Mineralisation at Ber Gebey, 3km north of Yacob Dewar will be tested in the same programme, followed by resource drilling. An oxide copper resource associated with the Yacob Dewar VMS will also be evaluated. At Frataka, south of Yacob Dewar, mineralisation was intersected during road-building, close to a copper-bearing gossan and geophysical anomaly. Drilling and trenching will be conducted following geological mapping and a reinterpretation of the geophysics. Alluvial gold on the Shambotai / Jawkerai / Gurgur gold trend in the southern half of the licence appears to be derived from quartz veining in carbonate and dioritic rocks. Limited drilling by Andiamo on the ridge above Shambotai intersected gold mineralisation, but additional geological and structural mapping and rock geochemistry is now planned to obtain a better geological understanding of the Shambotai gold trend prior to additional drilling. Other targets in the southern part of the licence will also be followed up. For example, an untested VTEM anomaly over the Okreb Gossan, which forms a low hill located between Shambotai and Frataka shows heavy metal toxicity to vegetation and a stream sediment gold anomaly. Geological mapping with geochemical sampling, ground geophysics and RAB / Air Core drilling will be conducted. The 91 km2 Mew extension to the south of Andiamo’s existing licence was granted in 2016. The area was part of a licence held by the now-defunct company Eri-Lib, which ceased exploration when the Libyan state collapsed. The extension contains 23 VTEM targets, several gossans and numerous colonial era and artisanal gold workings. Andiamo reviewed the extensive data collected by Eri-Lib and has conducted its own reconnaissance mapping. Drilling at Adi Merirey in the north of the licence area showed extensive disseminated sulphides including some copper mineralisation. Geological mapping with some soil and rock geochemistry will be conducted to obtain a better understanding of the geology around Adi Merirey and the alluvium-covered valley between it and Hoba. Shallow drilling or geophysics will be required in the valley. In the Mount Hoba area in the north of the licence, 3000m of drilling intersected a VMS ~30m thick with gold and copper mineralisation above sulphide stringer zone. The best intersection to date was 0.8% Cu over 28m. The target is 20km along strike from the Ashelli VMS discovery by Bisha Mining which has stated that its aim is to explore “a Flin Flon type district with good potential of additional deposits”. In addition to the targets in the Haykota licence, Dr Berhe has identified two extremely prospective targets elsewhere in Eritrea. Both targets are “low-hanging fruit”, drill-ready or nearly so. One is an orogenic gold target with close similarities to the 1Moz Zara deposit. Lithogeochemical sampling revealed good grades over a substantial area, with grades in excess of 100g/t. The other target appears to be a VMS which is likely to have a high-grade oxide gold cap. Relatively little surface work is required before the targets can be drill tested. If adequately funded, Andiamo could easily acquire title over these areas.